Faster and safer charging with Amkette Power Pro Rapid car charger. With the Smart Charge Technology, the output of both USB ports is optimized as per the charging requirements of your smartphone/ tablet. SMART CHARGE TECHNOLOGY: Amkette Car Chargers are SMARTIFIED with Smart Charge Technology, which offers optimum current as per requirement of your smartphone or tablet specifications. SAFETY CIRCUIT AND EXTRA CABLE: Amkette car chargers are designed with inbuilt safety circuit to protect your smartphone or tablet against overcharging, overheating & short circuit situations. 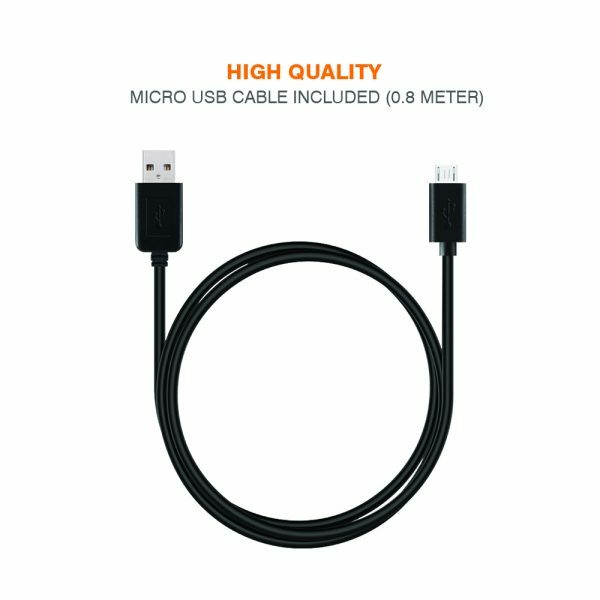 A Micro USB Cable is bundled along with the charger to charger basic devices with Micro USB Port. EXTENDED COMPATIBILITY: Supports all iOS smartphones like iPhone 7, 7 Plus, iPad etc. & All Android smart phones and tablets like Google Pixel, Samsung Galaxy S7, S7 Edge, Moto G4, Lenovo K5 Note, Xiaomi Redmi Note 3, Gionee S6 and many more. (Please note only Micro USB cable is bundled along with the charger, to charge IPhone and C-type devices, another lightning, 30 pin or C-type (according to requirement) Cable is required). DUAL PORT: Dual port USB charger connects two devices simultaneously with current output of up to 3.4A. The charger is also designed with 3 safety layers for extra protection. Struggling to find a better car mobile charger that support almost all smartphones and optimize the output power as per the specification of the phone, well AMKETTE POWER PRO RAPID CAR CHARGER does the job for you. With the SMART CHARGE TECHNOLOGY, the charger automatically optimizes the output at both of the USB port according to the need of the Smartphone connected to it. The multifunction technology of the dual USB port offer charging of up to two devices simultaneously. Amkette cares for the safety of your smartphones that’s why the car charger has INBUILT SAFETY CIRCUIT to protect the connected devices against overcharging, overheating & short circuits. Elegant durable glossy abs finish helps to enhance looks with the premium design.